What does Williams do for the country, Washington Monthly asks? There's a new kid on the block when it comes to college rankings -- The Washington Monthly. U.S. News has had the field for years but the new Washignton Monthly list attempts to rank schools on a social-justice and service-to-the-country basis. Williams, the perennial No. 1 in the U.S. News ranks among small, private, liberal-arts colleges, doesn't fare so well. Washington Monthly's editors acknowledge it is the first year of their effort and they want to fine tune it. But Washington Monthly can be commended for encouraging some deeper thinking about the role of "the academy" in promoting ethnic diversity and a more class-less society. Bart Reidy, for 11 years the year-round face of the Williamstown Theatre Festival in Williamstown, is moving eastward to take a position as development-communications director with the Boston Symphony Orchestra. Williamstown's reputation as a bicycling center receives a boost on Saturday with the first running of what is hoped will become an annual event -- the Hoosic River Ride. More than 80 riders are pre-registered for either a 31-mile or a 64-mile loop that runs through three states. For information on how to register, and the routes, click HERE. Williamstown supporters of Cindy Sheehan -- the mother camped out near President Bush's Texas ranch -- are planning an anti-war vigil starting at 7:30 p.m. tonight (Wednesday) at Field Park in Williamstown. For details, click HERE. THIS ITEM UPDATES AN EARLIER STORY. A letter from Williamstown Town Manager Peter Fohlin discusses the status of an 105-acre parcel on Henderson Road which since 2001 has been pledged to become conservation open space under a grant to the Williamstown Rural Lands Foundation. Fohlin’s Aug. 9 letter to the planning board explains that a trust with dot-com millionare William “Bo” Peabody as sole beneficiary bought a 167-acre farm from Norm Sweet in October 2000 for $800,000 – and has now sold most of it off to a partnership involving engineer Vince Guntlow for $2.3 million. Peabody’s trust also claimed ownership of 41 acres of adjoining land classified in town records as “owner unknown” – but is in litigation over the town’s assessment of $25,360 in back taxes on that parcel. According to Fohlin's letter, Guntlow’s group “has made arrangements” whereby Peabody’s trust will pay the back taxes and give the land to the Rural Lands Foundation – if Guntlow’s subdivision of the 167-acre former farm proceeds. The planning board apparent blessed the subdivision last week although the formal decision wasn’t filed as of earlier this week. Peabody’s group promised when it got an earlier subdivision plan approved that it would give 100 acres to rural lands – and develop eight lots. Now it looks like the WRLF will get its 105 acres (the 41 acre piece plus another 64 acres of the rest) -- but there will be 13 lots developed for housing -- including one lot which will be given to the town as an "affordable-housing" lot. CLICK FOR PAGE ONE. / CLICK FOR PAGE TWO. Member/donors filled the Clark Art Institute auditorium on Friday to see and hear details of a major reconfiguration of the museum's Williamstown campus -- two new buildings over the next five to eight years, both designed by famed Japanese architect Tadeo Ando. 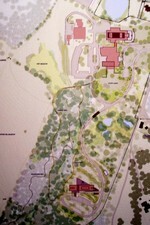 "It will be a very special 'chapel in the woods' kind of experience," the museum's director, Michael Conforti, told members as he introduced a slide and video presentation which included comments by Gary Hilderbrand, principal of landscape architects Reed Hilderbrand Associates of Watertown, Mass. Conforti also announced that Peter S. Willmott, former COO of Federal Express Corp. and a longtime Williams College trustee, had been elected president of the Clark's trustees, replacing Francis Oakley, who retired. "This project begins another phase in the Clark's life," said Hilderbrand. "[It's] about preserving the great landscape that is here, and enhances it, uses it." In a first phase, to be completed by 2008, the Clark will spend $20 million to construct a new building housing the Williamstown Art Conservation Center, so that the center's current building can be razed to make room for a Clark expansion building. But the Clark says the wood, steel and concrete, 32,000 square-foot facility will house new, intimately scaled galleries, a meeting and studio art classroom, a terrace and an outdoor café in addition to workspaces for conservators of paintings, furniture and other objects. And it will be constructed halfway up Stone Hill, a lookout owned by the Clark, a seven-minute walk along a stepped pathway from the Clark's main buildings. Conforti called the new building a marriage of conservation, art and nature. In fact, the title of the video touting the project: "Art in Nature." Ando, speaking through an interpreter, said the aging of the world's population has opened up the need for people to learn earlier in life how to understand culture, so that they are not left with little to appreciate after retirement. Ando said he was struck by the ingredients of nature and art on the site. He called the conservation building chapel-like architectural jewel, and said he envisioned the walking paths to it akin to a "treasure-hunt trail." Alluding to the Clark's decision to abandon a relocation of the conservation center to a site on U.S. Route 7 near Mount Greylock Regional High School, Ando spoke of the many hours of work and redesign he undertook. "I really feel the passion and the determination from Michael Conforti and his staff," Ando said through the interpreter. "I have been trying very hard to understand what their visions and mission are." Willmott, who has homes in both Chicago and Williamstown, took to the podium briefly after his appointment was announced by Conforti. "I am humbled by this assignment I've been given," Willmott remarked. "You can see how these buildings and these grounds expand so beautifully from the base that we have." Willmott said he looked forward to guiding a "world-class leading art institute and research center." PHOTOS: Top, Conforti and Ando, gesture over a scale mockup of the new buildings; below left, a rendering of the site showing the new conservation building (bottom), halfway up Stone Hill. Click on either photo to enlarge. THIS STORY HAS BEEN UPDATED. CLICK HERE FOR UPDATE. Minutes of two 2001 meetings of the Williamstown Planning Board show that a subdivision was approved for the Sweet Farm property on Henderson Road after the then-owner assured that half the 200 acres would be donated to the Williamstown Rural Lands Foundation, and based upon the assumption that the development would be “low density” – eight lots dispersed over a 100-acre hillside. Subdivision plan was approved via a Dec. 28, 2001 planning-board order, according to public documents provided to GreylockNews.com by the town. The applicant for the subdivision at the time was the Sweet Farm Nominee Trust, whose beneficiary, according to minutes, was dot-com millionaire William “Bo” Peabody. The trust was represented by attorney Sherwood Guernsey at a Nov. 13, 2001 public hearing. The Dec. 28, 2001 order granted a series of seven variances for subdivision requirements, based upon a finding that the project was “low density” – eight lots dispersed over a 100-care hillside. CLICK HERE TO READ THE PLANNING BOARD DOCUMENTS. What is Mount Greylock Regional High School doing about recruiters? A national debate is intensifying over the degree of access military recruiters have to the names, addresses, academic records and demographics of high-school students. In Berkshire County, a group called Berkshire Citizens for Peace is working with the Pittsfield public schools to provide an easy way for parents to "opt-out" of a requirement of the "No Child Left Behind" act which otherwise requires school districts to provide such information. The focus of the group is to make sure that anti-recruitment activists have "equal access" to students at the same time and in the same manner as provided to military recruiters, according to Emily Nichols, one of the group's organizers. The group has set an Aug. 21 planning meeting and a Sept. 29 information meeting for parents. "Section 9528 of the No Child Left Behind Act, from which parents (or students if 18 years old or older) are given the opportunity to opt out, only specifically mentions names, addresses, and telephone numbers," BCP organizer George Desnoyers wrote in a recent email. "On account of that, and on account of being given that information by the school department in accordance with the law, parents and students are likely to think that those are the only pieces of student information given the military. But we know that the military recruiters ask for, and the schools provide, more than those three bits of information. We need to know, and all parents should be told, all the kinds of information that are given the military." In Great Barrington, school officials provide an easy-to-complete opt-out form in a mailing to parents during August. What is Mount Greylock Regional High School doing? To print out an op-out form, CLICK HERE. COMMUNITY-WIDE SALE STILL IN NEED OF DONATIONS -- The South Williamstown Community Association is sponsoring a tag sale scheduled for October 8th at the Little Red School house historic building and will be taking donations at the building on Route 7, Saturday, August 13th from 9:00am-12:00pm. Good condition household items and furniture, antiques, art and other ephemera are welcome, excepting, clothing, books and computer ware. Individuals who may be moving or simply wishing to clean-out are encouraged to call 458-9578 or 458-2360 to arrange for a pick-up of larger items. The proceeds are to be used for making this historic site handicapped accessible to the public. There will be two more dates for drop-off planned –September 10th and 17th. Already the Association has received a number of very unique items that should be of interest to many looking to find treasures not routinely available elsewhere. Individuals or businesses may become sponsors for $100 tax deductible donation by calling 458-5147 and will be so recognized in all publicity and acknowledgements relating to this event. Paul Rinehart spent the day on Monday filling out monthly reports for the U.S. Bankruptcy Court. The 21-year owner of The Spoke Inc., the Williamstown bike shop that reopened June 22, is working through a very public ac counting with the Internal Revenue Service for what he figures is between $55,000 and $75,000 in back taxes. To avert a tax auction of his $200,000 inventory, Rinehart filed a voluntary Chapter 11 petition in the court and now he is paying out 20 percent of his gross to the IRS while a long-term payment plan is worked out. Rinehart says it took five years to get that far in arrears with the IRS – while paying all other vendors right along the line. But the hardest thing Rinehart says has been acknowledging that he has been a poor manager of his own business. Now he’s contracted out payroll and accounting so he can focus on being an mechanic and customer-service person at the Main Street business. The IRS padlocked his store in late May and it reopened after the court filing. For customers, nothing has changed and the daily sales numbers are right back to previous years, he says. Rinehart is still amazed at the number of people who offered their support – even financial – during the shutdown. “They realized that you could be good at one thing and not good at another and they were a bit mystified why I didn’t farm out all those things years ago.” Rinehart is considering what to do to stop the losses at the shop. He’s not sure yet that raising service rates or prices is the right way to retread the business. Stay tuned. The soon-to-be-updated Spoke website is at http://www.spokebicycles.com and is reached at 413-458-3456. Hours at 10 a.m.-6 p.m. weekdays, until 5 p.m. on Saturday and closed Sunday.